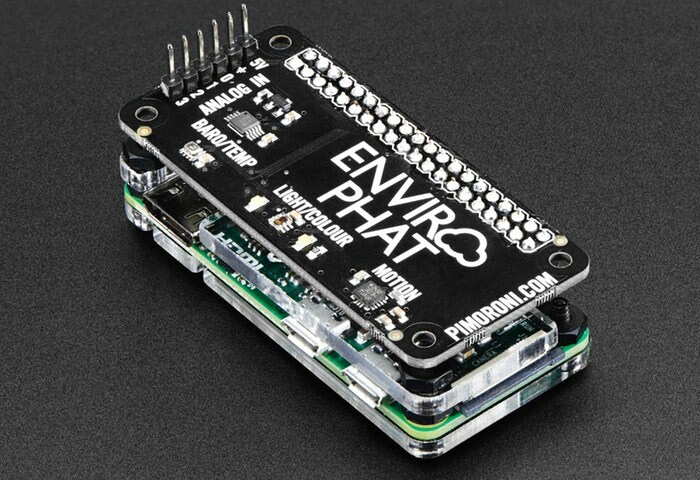 Adafruit has this week announced the arrival of the new Raspberry Pi Zero Pimoroni Enviro pHAT which is equipped with four different sensors enabling users to measure temperature, light, pressure and colour as well as three axis motion, compass heading and analog inputs. The tiny Enviro pHAT simply slots onto the top of a Raspberry Pi Zero mini PC and provides up to 10 different variables to use on your next project. The pHAT is powered directly from the Pi and Adafruit explains it can be set up to use a web server using Flask which will allow you to remotely monitor your Pi Zero and pHAT board. Ideal for monitoring conditions in your house, garage, and more, the Pimoroni Enviro pHAT packs 4 different sensors, letting you measure temperature, pressure, light level, color, 3-axis motion, compass heading, and analog inputs. That’s up to 10 different variables! Snap it on top of a Raspberry Pi Zero (or really, any Raspberry Pi with a 2×20 connector) for a comprehensive environment-sensing pHAT powered directly from the Pi. Set up a web server with Flask and remotely monitor everything from anywhere. As with other pHATs, it works with all of the 40-pin Raspberry Pi variants – 3/2/B+/A+/Zero – but using it with the Pi Zero makes for a super-tiny package. For more information on the new Enviro pHAT jump over to the Adafruit website for details by following the link below. If you found this article interesting you might also be interested in this list of awesome Raspberry Pi Zero projects we have put together.